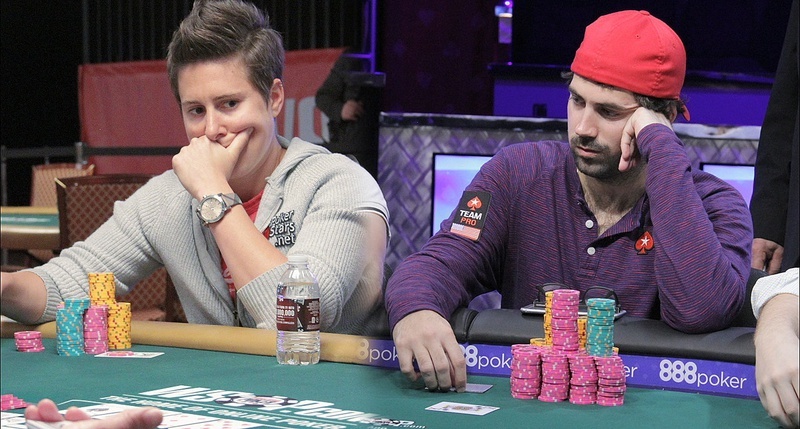 When Jason Mercier won the $10,000 no-limit deuce-to-seven lowball earlier this week he was one third of the way to taking $1.8 million from fellow poker pro Vanessa Selbst. Selbst agreed to a bet against Mercier, a four-time bracelet winner after his victory this week, winning three bracelets this summer. Only a handful of players have ever done that before. Selbst made nearly the same bet against Polish poker pro Dzmitry Urbanovich. In nearly 47 years of the WSOP, someone having a three-bracelet summer has only happened five times. Jeff Lisandro last did it in 2009. In both wagers, which happened in January, Selbst’s opponents risked $10,000 of their own money. Unlike the bet with Urbanovich, the bet with Mercier wasn’t publicized. Unlike the 21-year-old Polish pro, Mercier is no WSOP rookie. He was the massive chip leader with seven remaining in the $10,000 razz event on Wednesday, which gave Selbst quite the sweat. She has already began trying to sell off action as a form of insurance against losing the seven-figure wager, but it’s unclear if that will help her. Urbanovich hasn’t yet cashed at the Series, so she isn’t worrying about that one. According to Selbst, she made the Mercier bet when drinking and tried to buy out of it for $1,000 when sober, presumably the next day. However, Mercier refused. He also refused a $100,000 buyout this week after he won his first bracelet of the summer. Mercier of course chimed in on Twitter, saying that the $100,000 offer is too low at this point. He also disagreed with Selbst’s comment that she was highly intoxicated when it was made. While I'm no Vanessa Selbst fan for reasons I won't disclose,it seems like Mercier is being a jerk for rejecting a 100k buyout. 100k is not only fair, it's pretty generous. 100k is 5.56% equity of the 1.8 mil, and needing to win 2 out of a remaining 49 tournaments would essentially mean Mercir would have to be on average .0078 (127-1 odds) to win every tournament (if he were to enter every single one) to have a 5.56% chance of winning 2 more. Obviously, different tournaments will have different field sizes and degree of difficulty, but considering many of these tournaments will be 500+ fields, and some tournaments will overlap making it almost impossible to be competitive in every one, I think 100k is fair. Obviously this girl opened her mouth with a bit too much vigor (one of her flaws), and she has learned her lesson, and it's also obvious that 1.8 mil would hurt her, so let her get out for 100k. Mercir will make some decent coin, she'll have to humble herself, and it's a fair price. Take the 100k and be done with it, that's the norm when someone wants out of a prop bet and makes a fair buy out offer. She would be shamed and would have pay him..A bet is a bet .. I hope jason wins this bet in big way. Can't stand Vanessa. But she should be happy he hasn't taken buyout as winning 2 more is very very very longgggggggggggg shot. Drunken fool deserves to lose her money. Arrogance and bravado sometimes lethal combination. Go Jason go. Sorry Vanessa, you trying to get sympathy on this one is pathetic. Why is Jason supposed to accept, a bet is a bet and he is definitely not being a jerk IMO. Would love to see Jason win this, it would be good for poker and we'd get to see just how much of a whiner (and welcher?) Vanessa will be. So is pokerstars now going to ban selbst from their site as she said she was drunk and obviously gambling way out of her depth??? There is a bad taste with a lot of welshing going on ..